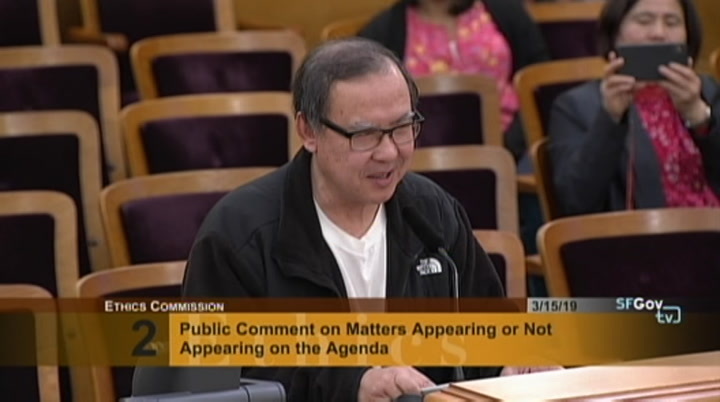 hear or see any dishelicopter behavior boy an employee please report it to say whistle blower program more information and the whistle blower protections please seek >> chair chiu: since our last meeting in february, commissioner kopp resigned. 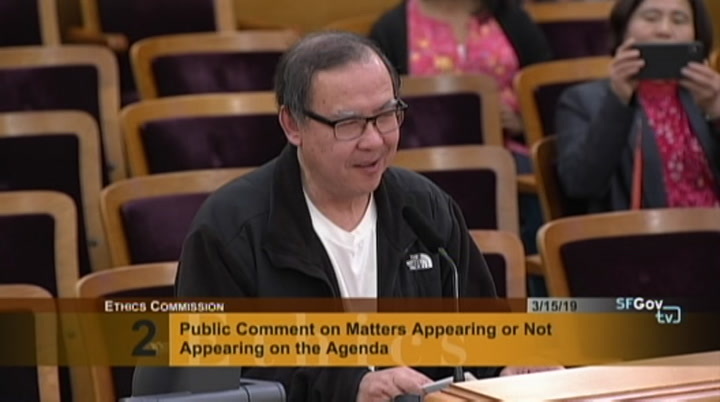 lifelong public servant, i wish to thank him for his dedication and service to the city and people of san francisco. 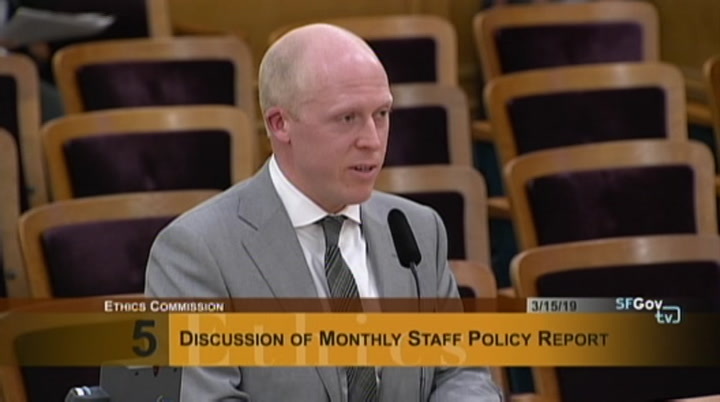 also for his service and contribution here on the ethics commission. second is hous housekeeping mat. the elected offices who support criminal behaviors. such as sanctuary city and allowing recreational cannabis to drug people first and then tell people to go rehab. it is government waste and abuse. 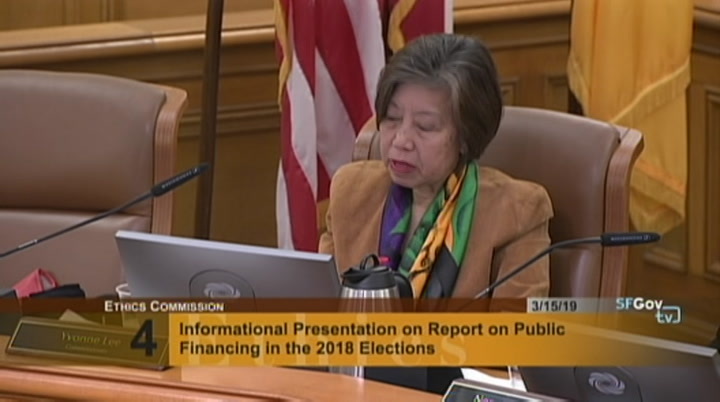 it has no form of government in san francisco. 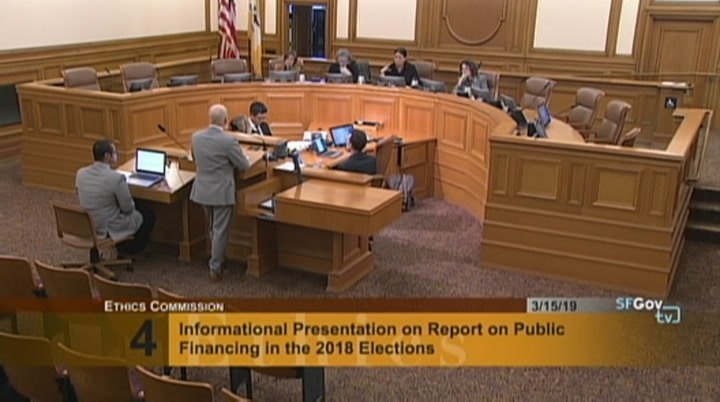 san francisco have been paid, bought, controlled by super pac action committee. 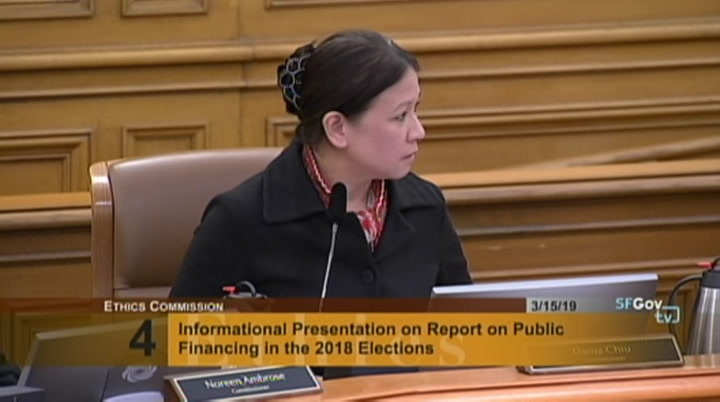 we the public employees, residents and visitors have been suffering from election fraud. super pacs, illegal drugs, crimes and public abuse. people are dying on the streets. 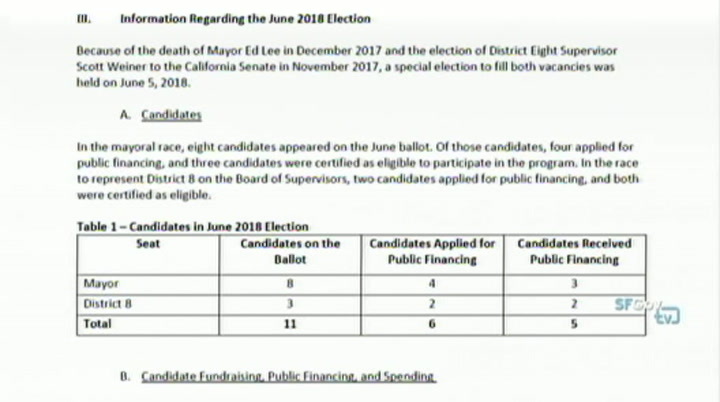 i was one of the eight candidates to run for mayor for the june 5, 2018 election. 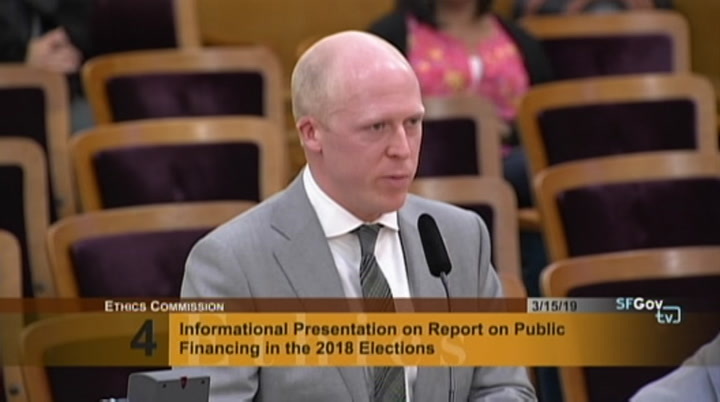 i was not allowed to more than 20 male candidates to debate in public places such as city hall with public buildings, public libraries and parks. i found those gait debates that organized by the democratic parties and democratic related agents. it has been running by one party, democratic party. all democrats only nothing, no republican no libertarian and no independent and none partisan party. i'm here today to ask you to interpret, the law and follow the law. >> chair chiu: thank you. 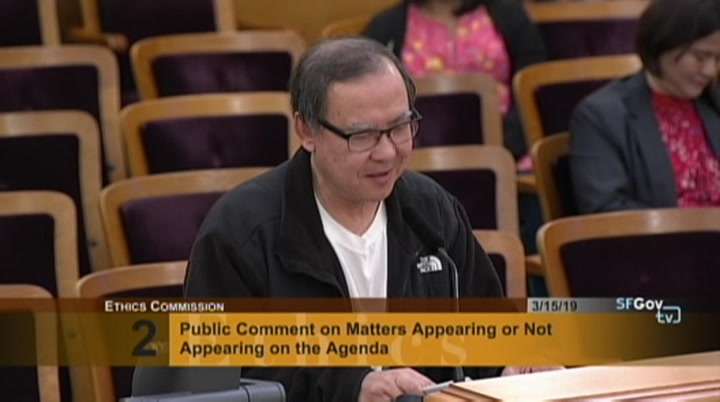 any other public comment. 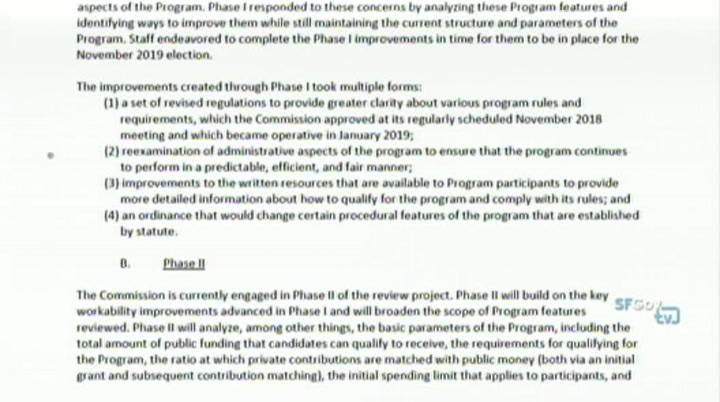 agenda item three. >> good afternoon commission. i lived in san francisco 67 years. unfortunately, i have to be here today. due to the absence of larry bush, quentin kopp and peter king and it's necessary for me to come back to city hall. certain things need to be put on the record so later on there will be no reason why nobody knew what was going on to happen. that's the reason it's on the record. let's be honest. certain factions allow the local people to try to do what they wish. or just provide numbers and information. it's not really meant to analyze a program or to make recommendations. we're doing that through the separate review process. you wanted to tee this up. that's what this is. i know you haven't had time to look at this, what aisl i'll doy is quickly go through the tables. we tried to represent the data in text but also in tables and charts. 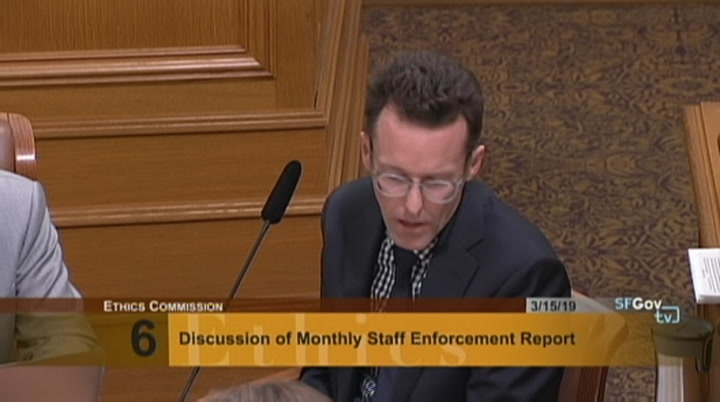 brian is going to go through the report and he'll go up on the screen. you can also follow along if you have a hard copy. 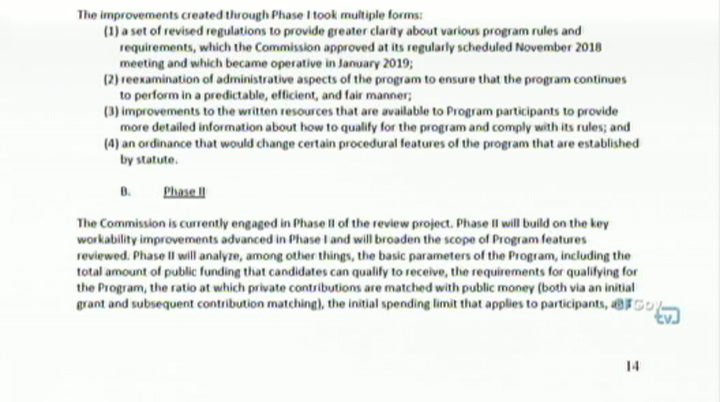 in the report, we give overview how the program is set up. 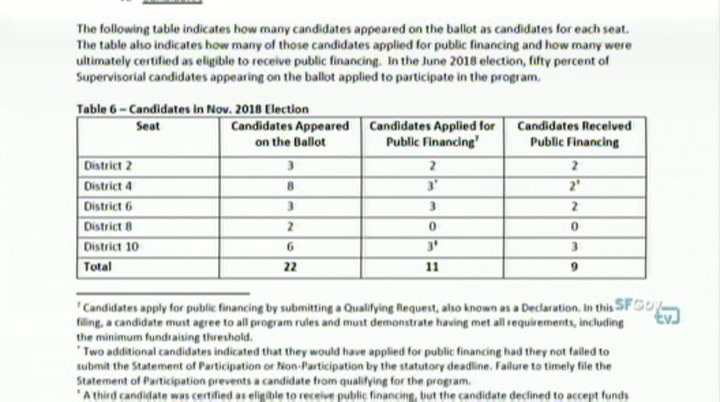 what it takes to qualify and what kind of funding candidates get under the program and then we also talk about how the program is funded through the election campaign fund. events occurred. that is contributions received by an opponent in the race or spending by third parties. either to support the candidate's opponent or to attack that candidate. 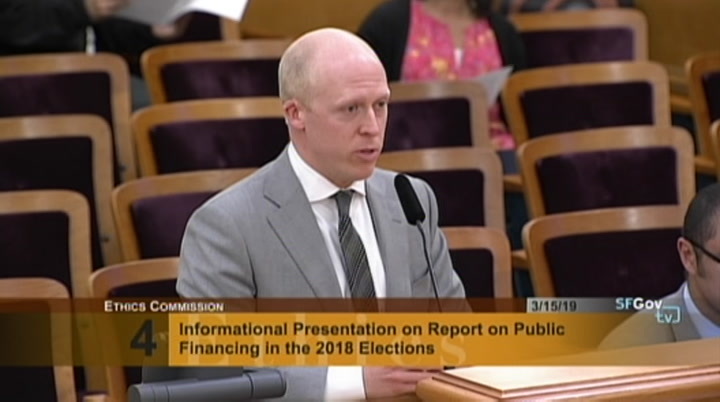 you add them together, if that exceeds the candidate spending limit, the commission must adjust that candidate spending upwards. we wanted to give some statistics about spending limits before they started where they were razeed to and etcetera -- raised to etcetera. that's an important part of the program. 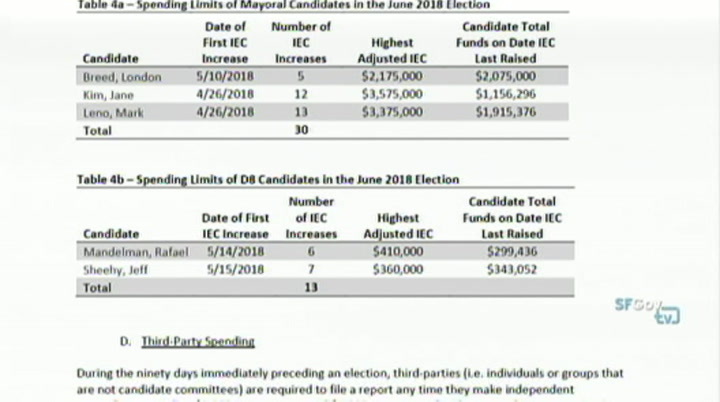 in the top table, you can see the three publicly financed mayoral candidates when they began to experience increases to their spending limits and how many spending limit increases they had. 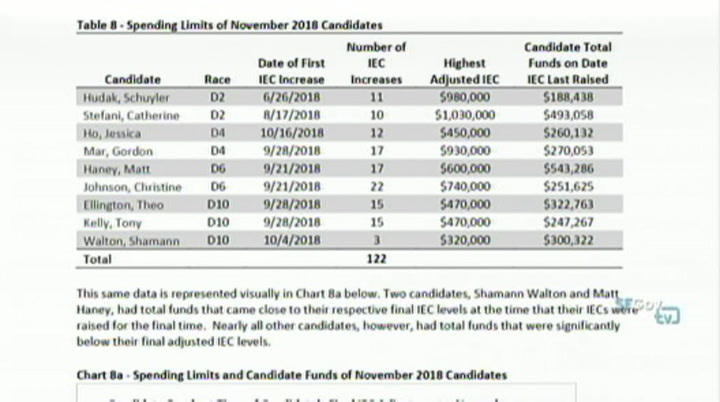 there were a total of 30 increases you can see which candidates received them. 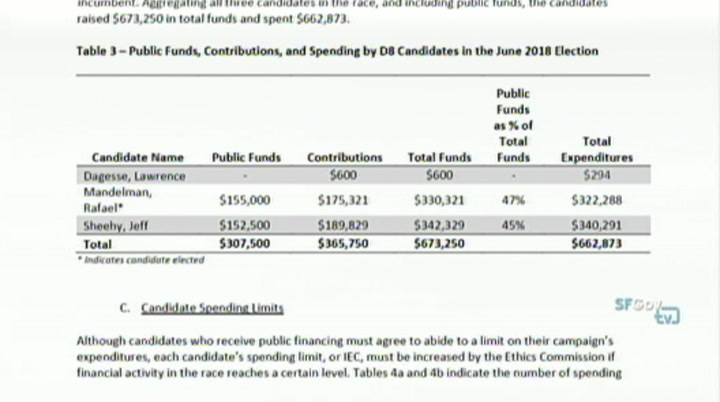 you can see the highest level to can the candidate's spending limits were raised. spending in support of those candidates. 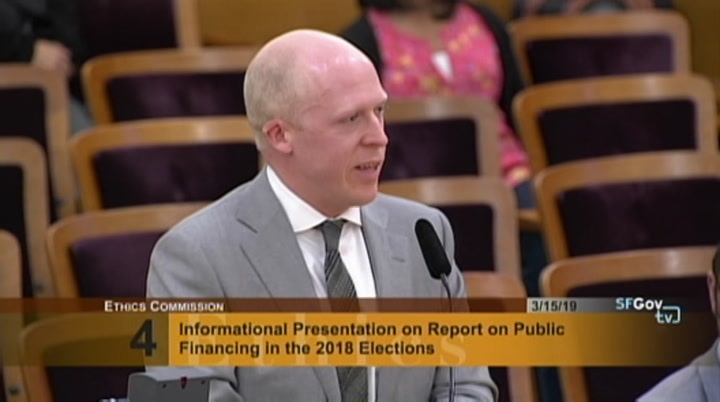 you can see there's about $2.1 million in support of spending. 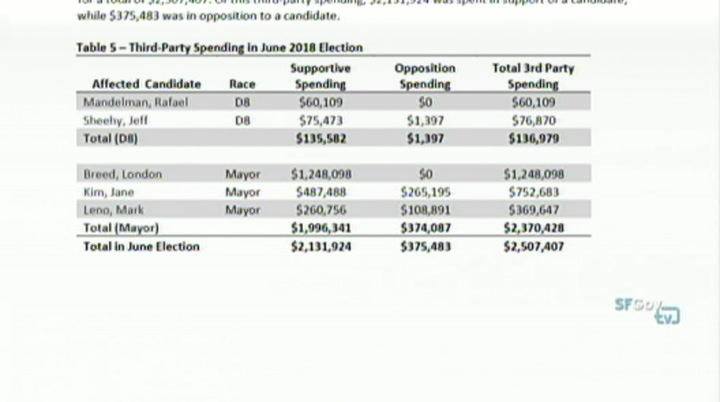 right around $2 million, third party spending in support of a candidate. 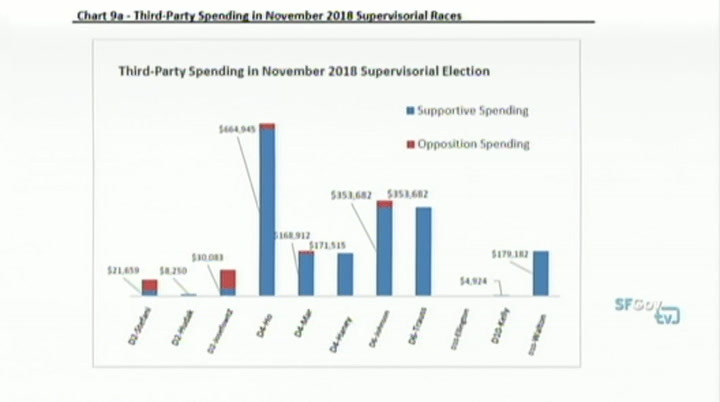 opposition spending was less. it's about just under $400,000. 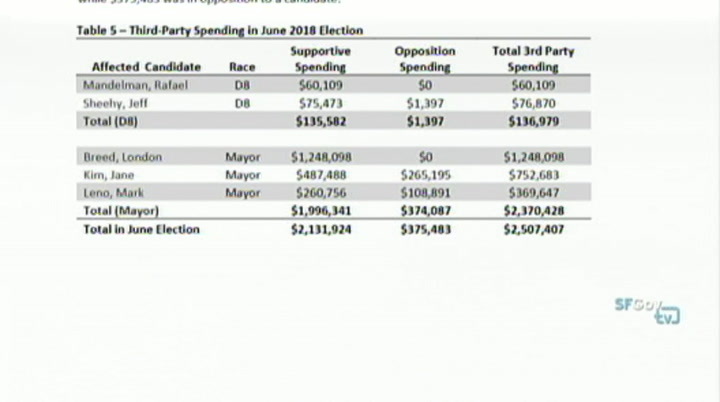 then adding that all together for the two races, there was about $2.5 million of third party spending. we also broke this down visually. we included a pie chart here that shows you supportive versus in opposition spending. the vast majorities of third party accidenteddin -- spendingt rather than oppose. 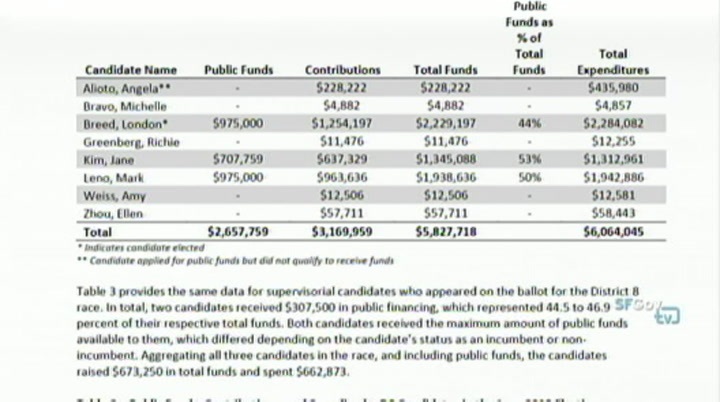 lot of the discussion about independent expenditures, revolves around whether or not they support or attack. there's a lot of criticism of negative third party spending. 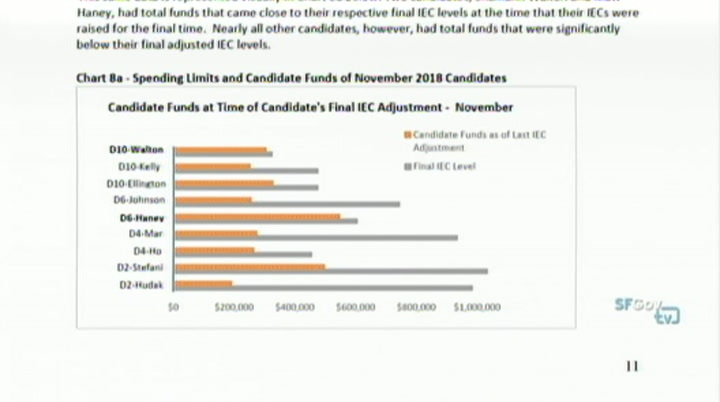 demonstrates where the candidates were in terms of the funds that he had to run their campaign. that's shown in orange. that's the candidate's total funds. 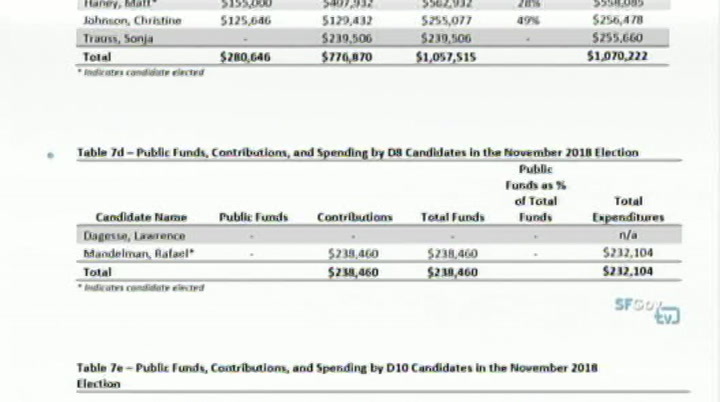 in gray, what they are spending limit was. you can think of spending limit as a proxy for what the candidate is up against. 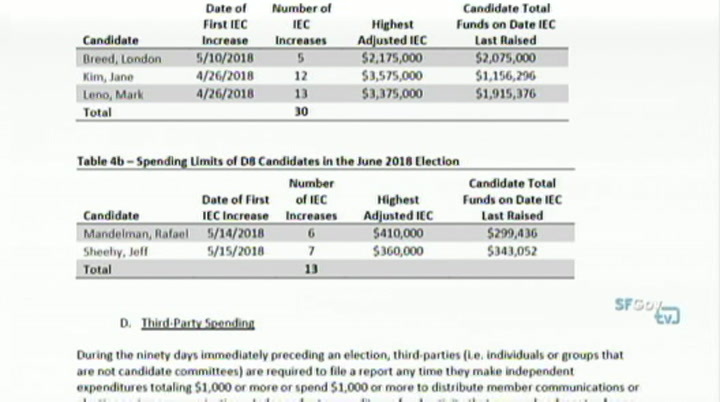 it represents the fundraising of the candidates highest funded opponent, independent spending in support of that opponent as well as third party spending in opposition to the candidate. add all three together that's what the gray bar is. you can see for some candidates they're pretty close. for other candidates they're far away. we thought that was relevant and interesting look to parse out. 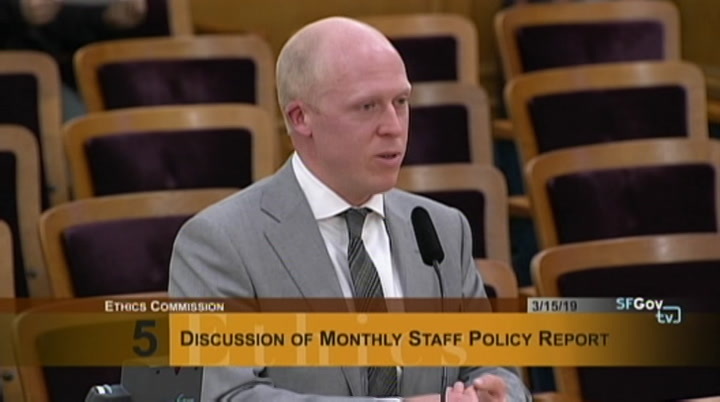 we also provided information about third party spending for the supervisorial ideas. broken down by supportive opposition and then total third party spending. provided lot of this data. it's a real collaborative effort. this will be on our website as well. 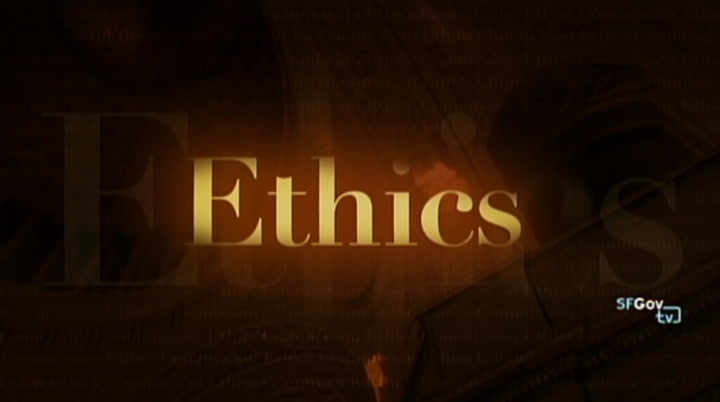 for folks watching at home, you can access it online. 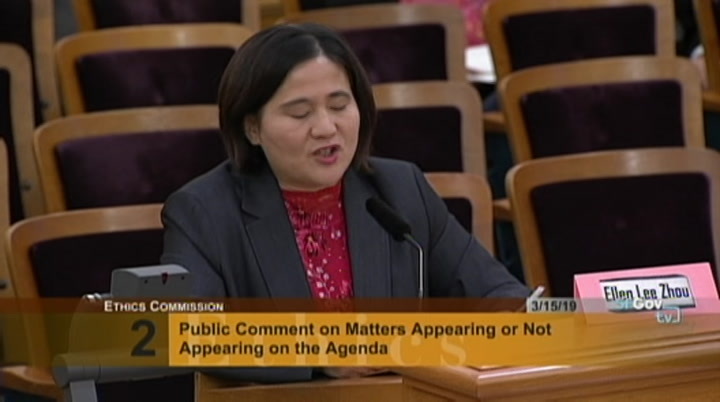 >> chair chiu: thank you this is a lot of information and thank you pat and brian and amy and everyone else in the office who put in the work to pull this report together. it's a lot of information to take in. open it up to my fellow commissioners if you have questions? 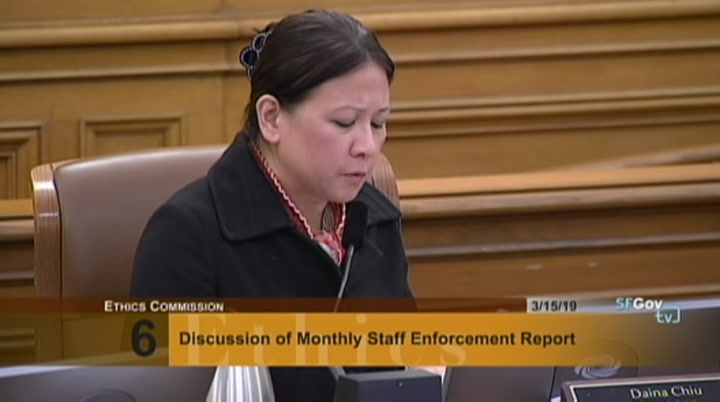 anythincommissioner lee. that there's $7 million at all times. 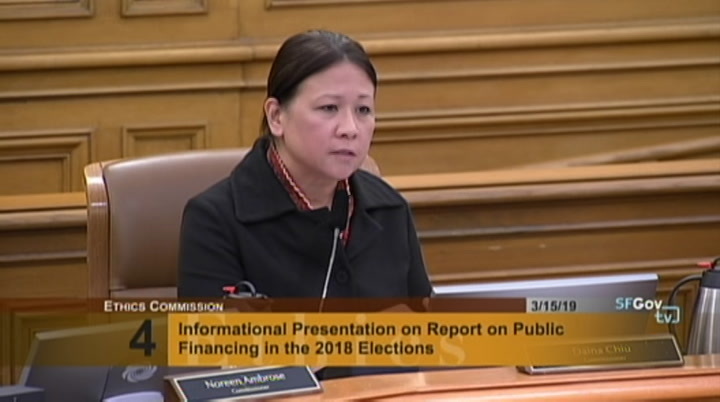 >> chair chiu: i would u would be curious to know what the trend has been in terms of the amount of funds that were used to support public financing. in the corporate world, if you didn't use it, you would lose it. 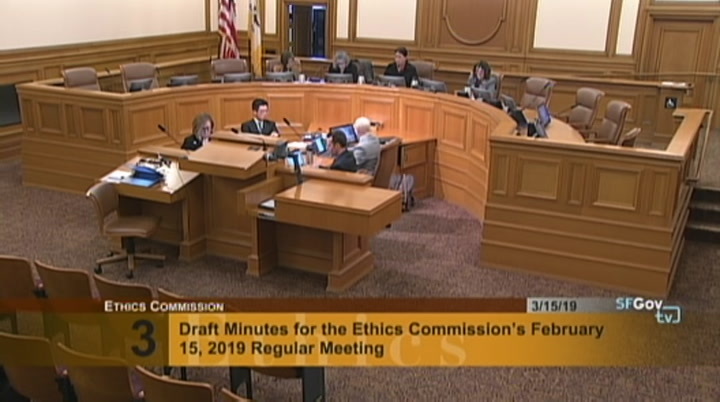 i would hate for that to happen here in the ethics commission context. 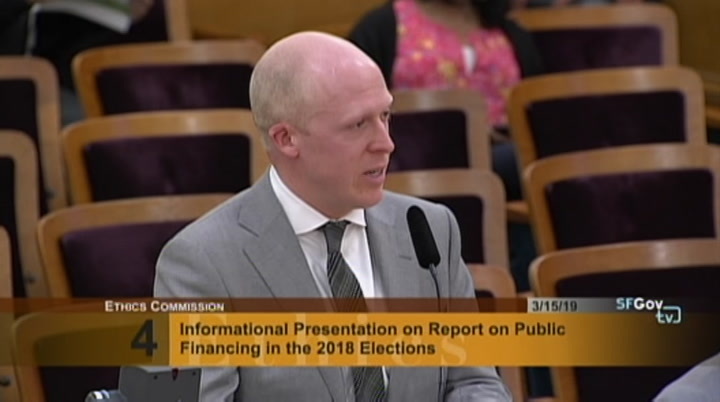 what can we do in order to make people more aware of the public financing program and to encourage greater or broad participation to allow candidates to make use of these funds. i know this is getting into policy discussions and another agenda item. that will be at a focus of an interest of mine. >> great. finance funding. 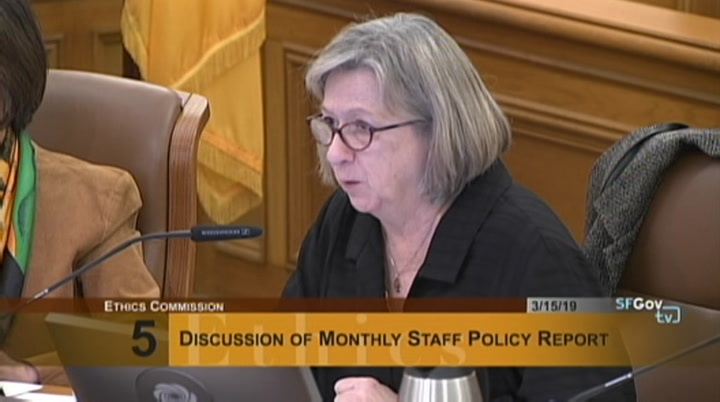 the number of san francisco residents based on the census, would have been reduced. right? 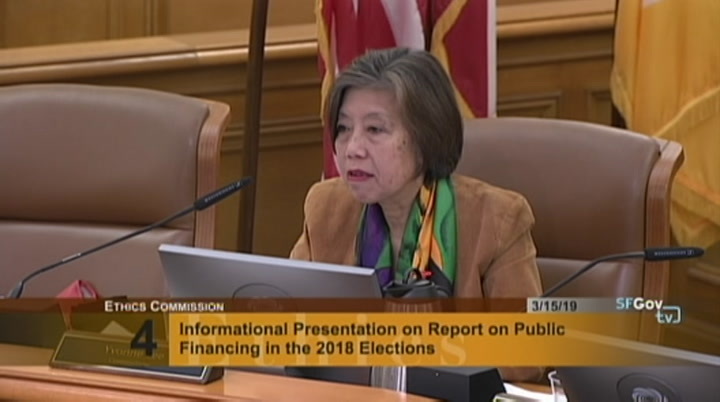 if the federal government were able to ask the citizenship question, scaring off -- not scaring off but discouraging a sizeable number of san francisco residents from participating in that the census, then the public financing pot would have been reduced based on the new census numbers. 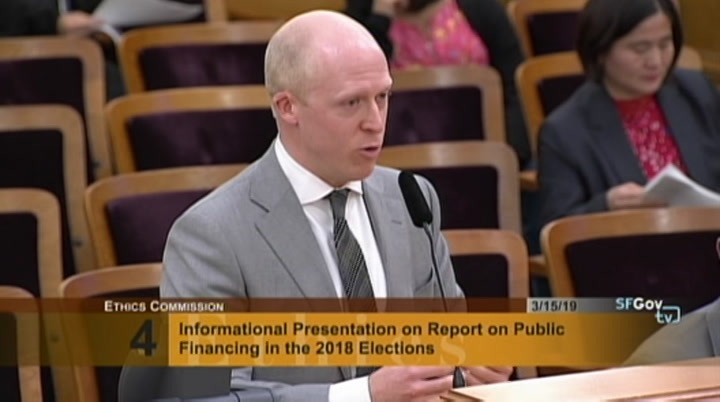 >> if it is the case but the comptroller relies on census information, then any drop would have that impact on fundings of the program. i'm not certain that's what they do. i don't know. 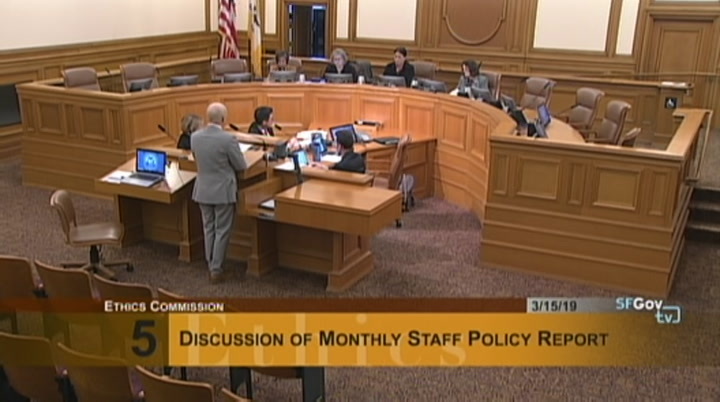 they may relying on city data. 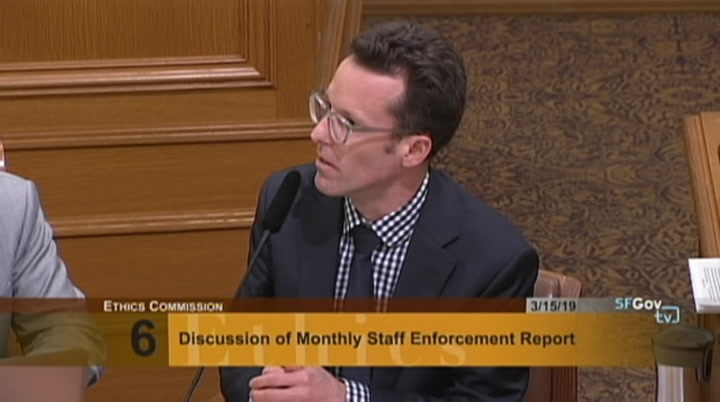 they may have other sources of data that other city departments keep about how many people live in the city. i'm glad to do that as part of the phase 2. 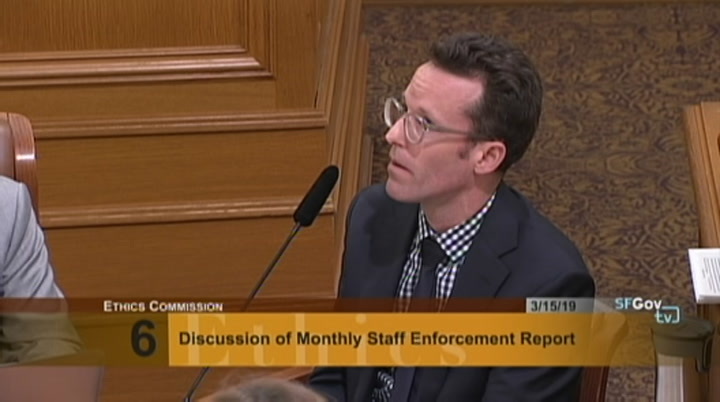 >> commissioner lee: i would like to know. 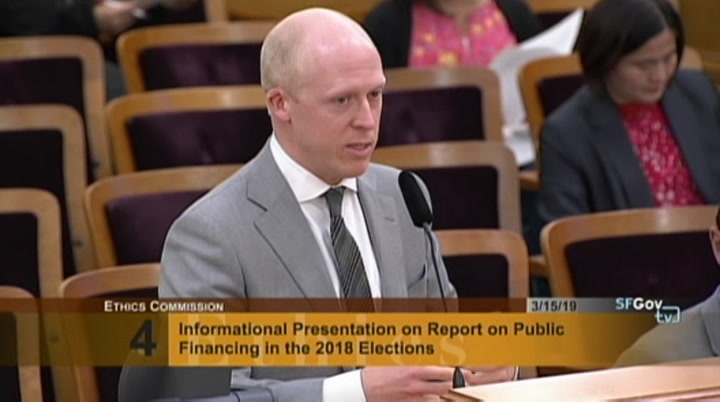 >> we'll look in greater depth, election campaign fund and how it's funded to get it exactly who you were talking about. what is the capacity of this fund? what can it fund and what happen arwhat are wecurrently using ans ram for growth without greater appropriation. i think that's part of that discussion. 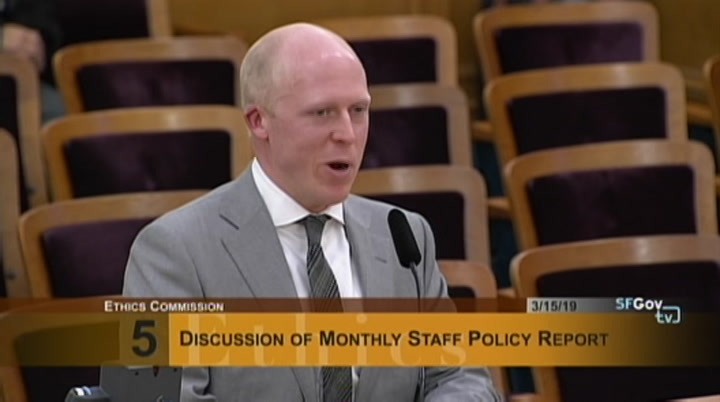 we can talk with the comptroller office to learn how they determine that residency number when they make the appropriations, how they do the math. it's definitely a great interest to us. 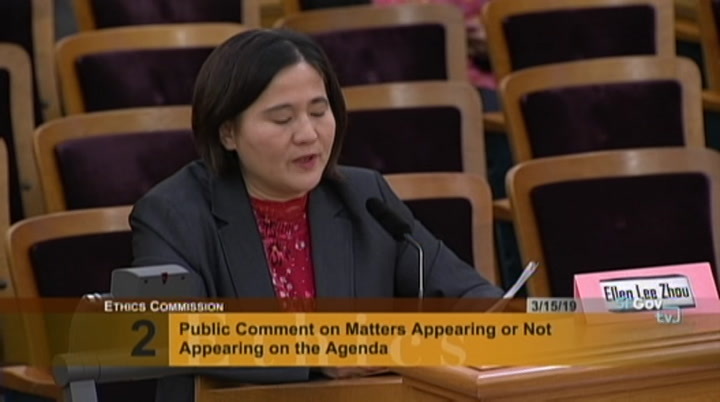 >> chair chiu: a point of information for this most recent years estimate -- >> comptroller used most recent census bureau population estimate that was available as of july 1, 2016. they did have some information. ly to pat pointing we can do that research. >> chair chiu: thank you. 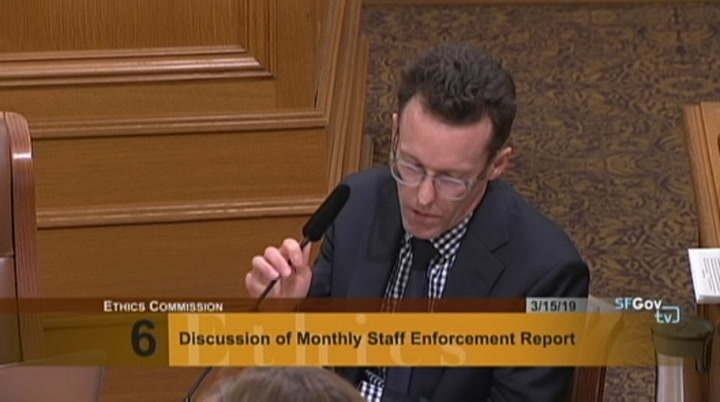 any other questions from the commissioners? any public comment? no public comment. 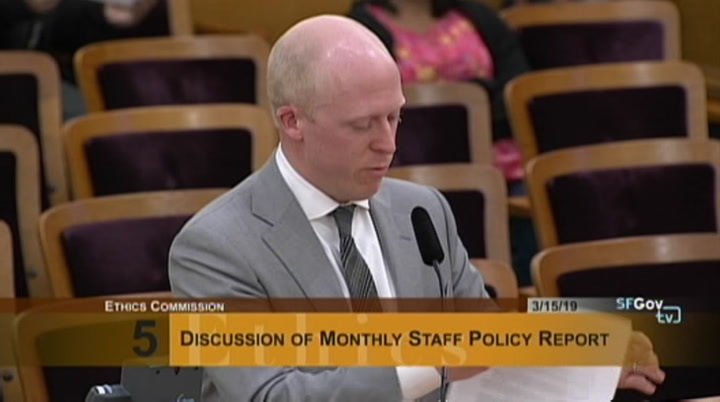 general item 5, discussion of the monthly staff policy report. >> thanks commissioners. 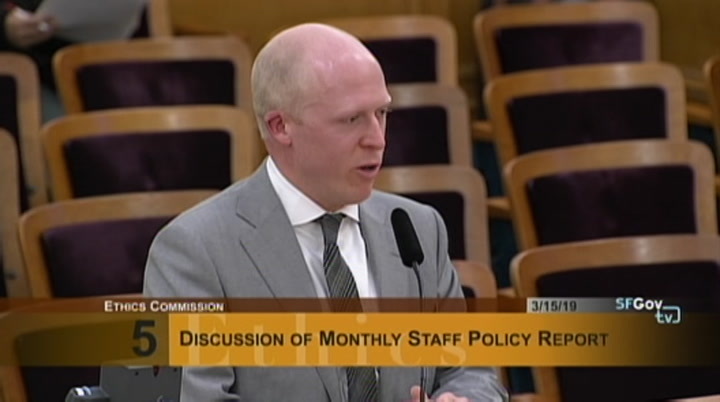 item 5 is the monthly policy report. i think the main item i wanted to highlight for you as you mentioned was that, we've been working on the second phase of the review, public financing program. 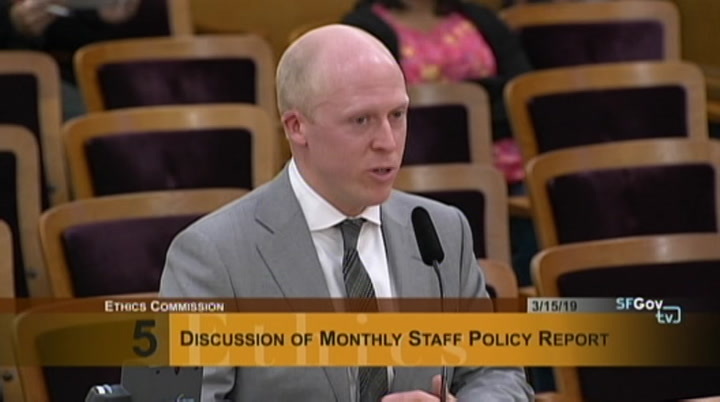 we had two interested persons meetings at 25 van ness. first one was on monday last week and second was on friday last week. we heard from folks who have been active in the first phase of the review and it was great to hear their thoughts on more of the second phase things. what do they think about candidate qualification requirements, what do they think about the funding the candidates able to get. is it enough? what are the features of the program they like to see the commission look at? matched. things like that is what we would recommend. it would go through and fix places where the regs are not in line with the code. we wanted to rectify those places. 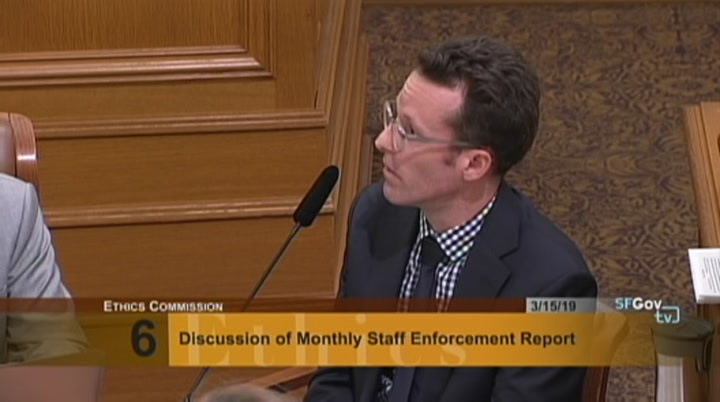 also just respond to areas where we've been getting lot of questions that need some clarification in the law. it's kind of omnibus overall improvement project that i've been wanting to bring to you for quite some time and had not had the capacity to get if before you. 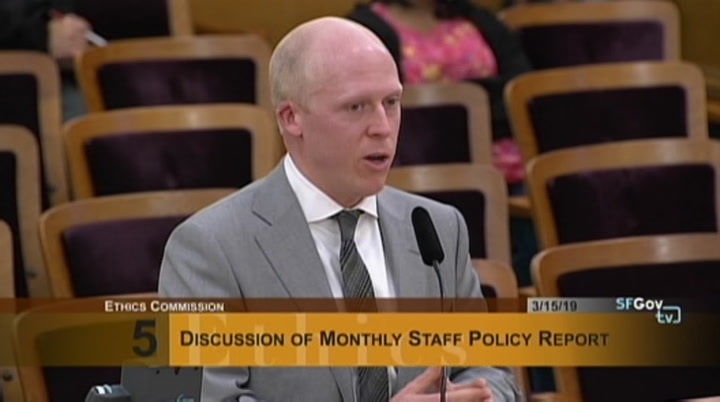 now we have mr. cox on staff, he's really doing lot of already on the public financing review project. i think that will free me up more to bring you these regulations. that's my goal to bring those to action items to you next month. etcetera. it you will be submitting written comment for the hearing, the board's hearing. would the commission have an opportunity to submit -- [indiscernible] prior to that to be included in the staff? 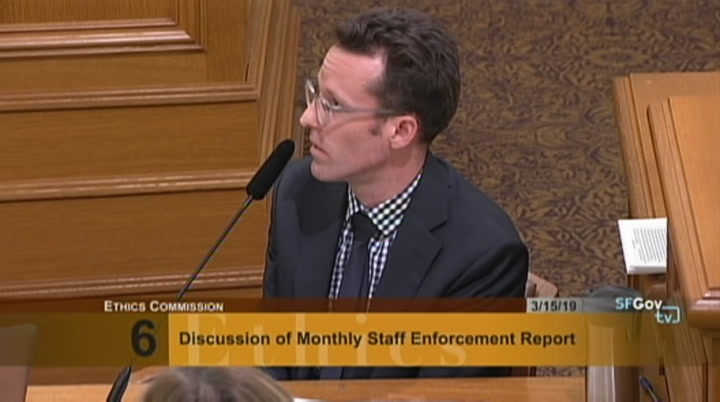 >> yes, more than happy to work with you or any of the commissioners to make sure that your concerns and questions are incorporated into that. what's challenging about this process, we don't know when it will happen. it's kind of hard. it's something i will move expeditiously on. i can be in touch with you to talk about this. 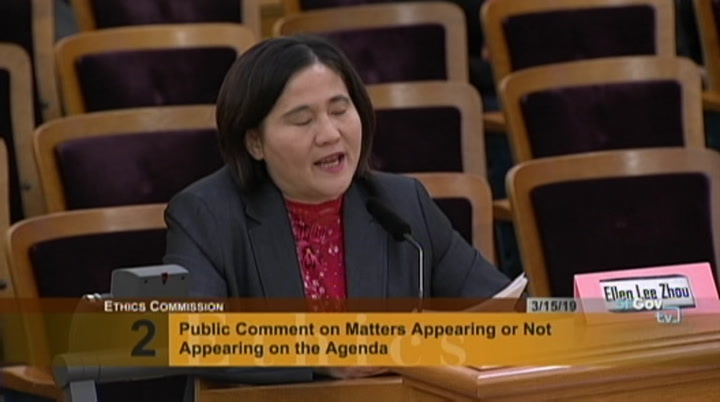 >> commissioner lee: thank you. discuss. -- and discuss. >> great. >> i think those are the main highlights i wanted to share with you today. i'll be glad to answer any question us might have. >> you have your final item here on the acao implementation. i'm assuming that the forms that you've been working on up and ready to go for the november election? >> yes. those will be ready to go. 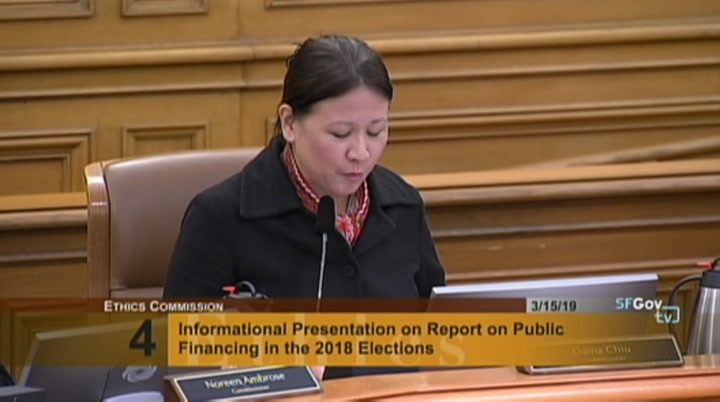 we're also working on getting these provisions into the candidate guides and any other written materials so that it's all out there >> chair chiu: any other questions for mr. ford? public comment? 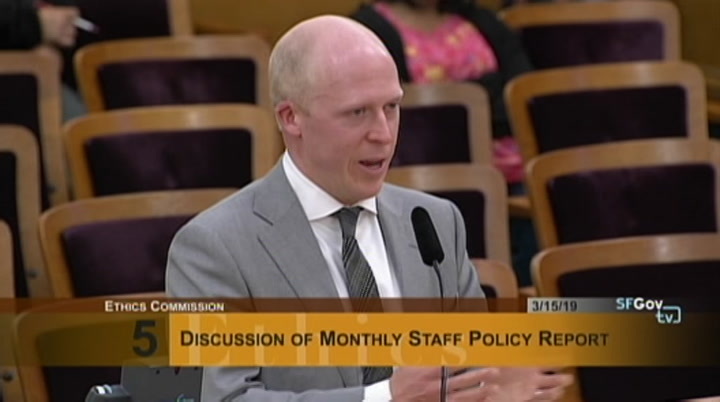 consisted of our counterparts from the state describing to participants the statutory framework for their retaliation. some of the legal issueses that affect that work like what whaa prima fascia case looks like. what protected activities constitutes the state level. they described in some detail how they make a showing of causation between protected activity and the employment action. 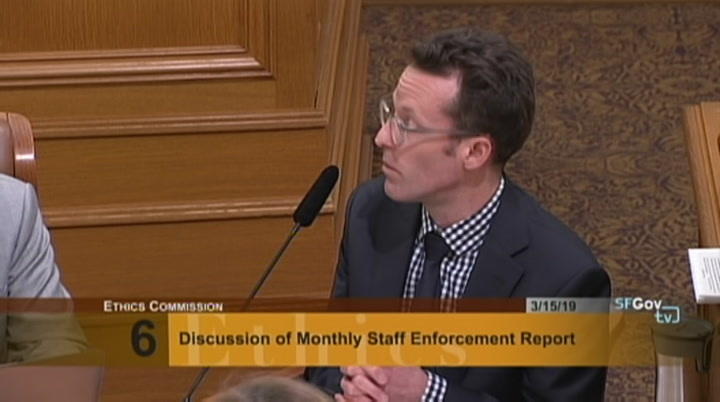 they also present on best practices how to go about investigating retaliation. retaliation. where employer takes adverse employment action against an employee who has not yet engaged in protected activity and historically the city reviewed protected activity as a jurisdictional prerequisite. if the retaliation happens before the protective activity, the state entertained claims of that nature, federal government has entertained claims of associational retaliation such that the adverse employment action is taken not against the individual who engaged in protected activity but in a family member of that individual or a close associate of that individual.